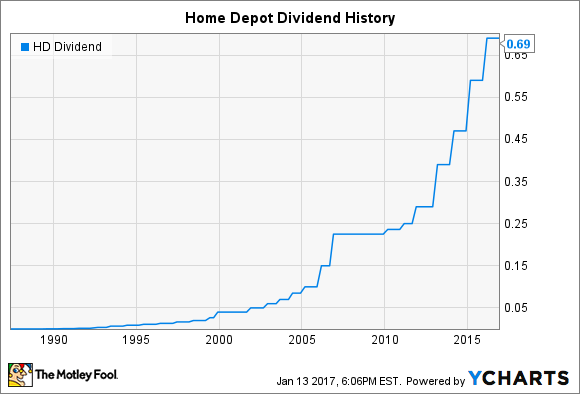 Will Home Depot Raise Its Dividend in 2017? The home-improvement retailer has a good track record of past dividend growth, but will slowing growth make it change course? The rebound in housing after the financial crisis was good news for homeowners, and it also helped drive improving results for Home Depot (NYSE:HD). The home improvement retailer benefited from greater interest both from do-it-yourself homeowners and from professional contractors, and investors have enjoyed not only long-term average annual returns in excess of 20% for more than 30 years but also significant gains in dividend payments. Yet with some now calling for a potential pause in housing's latest boom, fears are rising that Home Depot's growth could slow, causing it to rethink its dividend strategy. Let's look more closely at Home Depot to see whether investors can count on the Dow component to raise its dividend in 2017. Home Depot has been extremely aggressive in increasing its quarterly dividend payments in the recent past. In early 2016, the company gave investors a 17% boost in its quarterly payout, adding a full $0.10 to the dividend. That followed similarly impressive increases of 26% in 2015, 21% in 2014, 34% in 2013, and 16% in 2012. Prior to that, Home Depot was much more measured in its dividend increase policy, typically making boosts in the 5% to 6% range. The key to understanding why Home Depot's dividend growth accelerated so abruptly is in the big-box retailer's strategic vision for returning capital to shareholders. In late 2011, Home Depot made a decision to increase the amount of its earnings that it targeted to pay out in dividends, raising the anticipated payout ratio from 40% to 50%. That 10 percentage point increase resulted in an immediate 25% rise in the targeted dividend. Moreover, it further tied dividend growth to earnings growth, and Home Depot's rising earnings over time have been extremely impressive in light of favorable conditions and strong business execution. Is Home Depot under threat? Some have feared that Home Depot's growth will inevitably slow, but the retailer's most recent quarterly results suggest that a slowdown isn't happening just yet. Home Depot posted a nearly 7% rise in revenue on a 6% jump in comparable-store sales, and earnings per share jumped 14% from year-ago levels. Customer traffic growth remained strong, and customers also spent more per visit when they shopped at Home Depot. In addition, stock buybacks have reduced outstanding share counts, and that makes it easier for Home Depot to pay rising dividends without having the actual cash outlay climb at the same rate. Moreover, Home Depot has proven its resiliency even in times of past stress. During the housing bust of the mid- to late 2000s, Home Depot worked to tailor remodeling and renovation options to homeowners who were underwater on mortgages and therefore unable to trade up to more desirable homes. Once times got better and homeowners could afford to get professional help with home improvements, Home Depot tapped the contractor market more effectively as well. By remaining nimble, Home Depot has managed to stay ahead of changing trends. Home Depot's dividend policy ties its payout to earnings, and investors are optimistic about earnings growth over the coming year. With the payout ratio well under 50% and double-digit percentage gains in net income expected for the foreseeable future, Home Depot will almost certainly share its success with shareholders through a dividend increase in the typical February to March timeframe.